K and G Limousine provides competent, dependable and affordable car service to Manhattan. The major international airport in New York City, JFK is the busiest international air passenger gateway in the US. There are over seventy airlines that operate out of John F. Kennedy International Airport (JFK). Our professional team has almost 25 years understanding and knowing the ins and out of JFK airport. Our company has vast experience with luxury airport transportation and we have worked with thousands of business professional and touristic passengers. Our service eliminates any hassle related to your ground transportation. We have a full commitment to our clients’ satisfaction. Experience greatness when you choose K and G Limousine as your provide for JFK. John F. Kennedy airport is the busiest international airport in New York and the sixteenth busiest airport in the world. It has 6 operating terminals and 128 gates. Jet Blue and Delta Airlines are the two largest operators. Most people go straight transfer directly to Manhattan, as it is the center of New York City. There are 10 million passengers each per year but more than 70 airlines in the airport at JFK. Even within terminals. While waiting for your flight or for your loved ones to arrive, you can dine or have a cup of coffee. Our primary goal at JFK Limo is to transport our clients to and from John F. Kennedy International Airport efficiently and safely. Our John F. Kennedy Airport (JFK) Car Service caters to all group sizes, so regardless of the size of your party, we will accommodate the best vehicle from our fleet that will best suit your needs. Our company offers a prestigious fleet of impeccably maintained quality luxury sedans, limousines, luxury SUVs for larger groups. Especially if you want to spend time in Manhattan. We will make sure that when you choose our great airport car service to or from JFK, you will not regret it. Our company is required to be compliant with NYC rules and regulation for car service companies picking up at the airports. As such a reliable and great service will always be provided. We are available to be in Manhattan, Queens, Bronx, Staten Island and in Long Island. We have a constant system in which we are always up to date for the exact arrival and departure times. This means that in case of a delay to your flight, you driver will know and will be able to deal with this ahead of time, you will not be left stranded. Our well trained team of professionals will ensure you have a great trip in New York City. 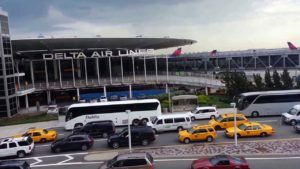 Our black car service to John F. Kennedy International airport will give you a meet and greet service, where our chauffeur will meet you at the terminal, assist you with your luggage and help you settle into the vehicle. Next time you travel and need a limo near you, relax and let our professionals look after every fine detail of your ground transportation and get you to and from John F. Kennedy International Airport.